Thanks to the annual Ring of Lights holiday home decorating competition, Balboa Island is ablaze with colorful and elaborate décor. This also means more people roaming the Island to get a glimpse of the often over-the-top displays, which is good news for Balboa Island shops and restaurants. 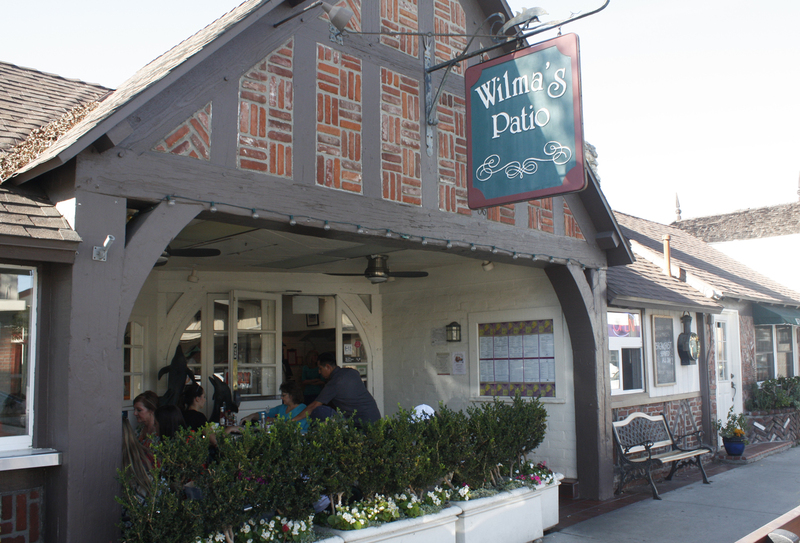 We’ve dined at a number of restaurants along Marine Avenue on Balboa Island, and have a few ideas of where to go for a bite and a beverage before or after walking the Island. And if you have your dog with you, good news—some of the restaurants are dog-friendly! renowned for its breakfasts (and they have pumpkin pancakes on their seasonal menu), but we’ve dined here for dinner and enjoy the hearty comfort food menu. Our last time out (with dog) to Balboa Island, we grabbed a patio seat and ordered the pot roast ($15.50), which comes with mashed potatoes and gravy plus seasonal veggies, and a slice of boysenberry pie a la mode ($5.75). Both dishes hit the spot. 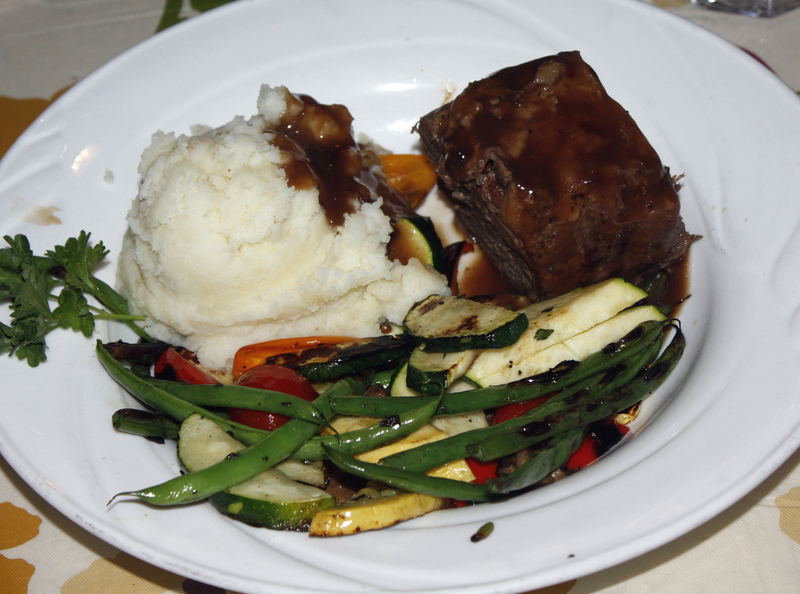 “The pot roast is so tender you don’t need a knife,” marveled Christopher. your dog and enjoy a good meal,” noted Catherine. Frank Crocker became Balboa Island’s first paid fire chief back in 1927, a position he held for 25 years. Now, his granddaughter Victoria De Frenza is carrying on the family name with Crocker’s “The Well Dressed Frank,” a small eatery she opened earlier this year that specializes in – you guessed it – hot dogs. But these are not just any hot dogs. 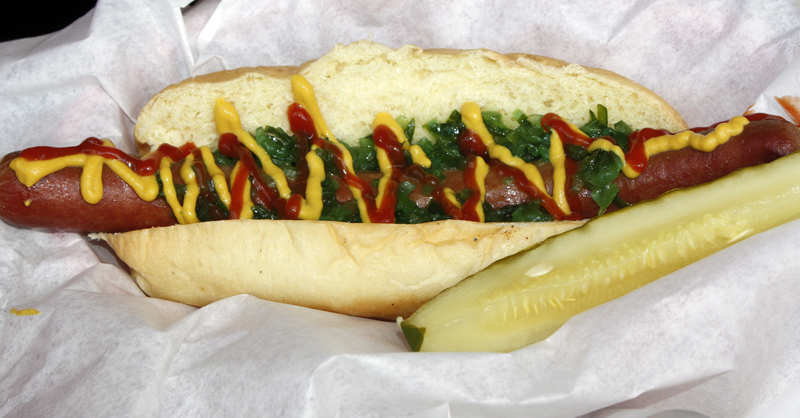 Crocker’s serves 100 percent beef franks that range from Chicago dogs (served on a poppy seed bun) to chili dogs to corn dogs. They range in price from $6 to $9. They also serve sausages, burgers, a fish sandwich, and some of the best fries in town. We’ve tried several dogs and fries, including the chili dog, which is a tasty mess. “And I’m not sure which I like better—the garlic fries or the sweet potato fries,” said Christopher. We also tried their clam chowder—another perfect cold-weather dish. And we enjoyed Crocker’s dogs with our dog at their outdoor table. One of the oldest family-owned restaurants in Orange County, Amelia’s has been around for 50 years and is still going strong, but it’s easy to see why. 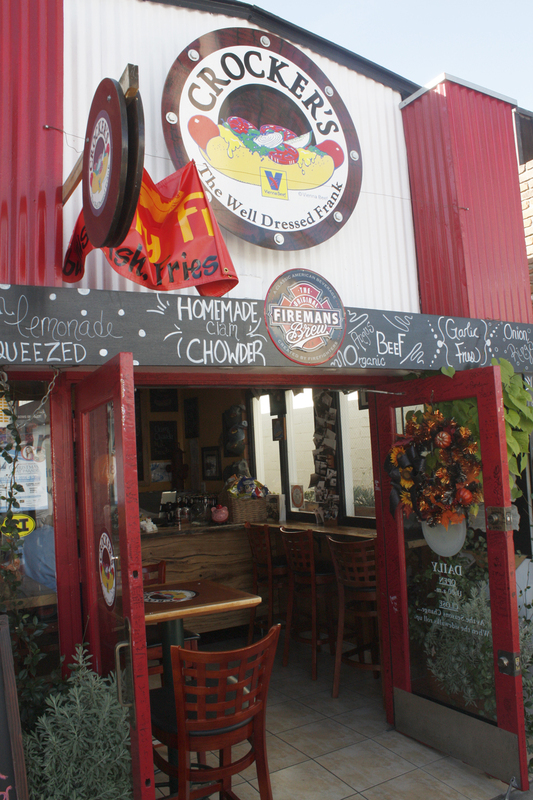 Amelia’s is a charming restaurant with great food at great prices. Passersby note the small table for two just outside the entrance, but no matter where you sit, you’ll have a good experience. Last time there, we tried the trio of cannelloni, manicotti and tortellini ($16), and the angel hair pasta with rock shrimp sautéed in garlic butter ($18). The portions on both dishes were generous, and the flavors blended perfectly. We shared a bottle of wine (a $19 Chianti) that went perfectly with the dishes, and were so full we vowed to return another time for dessert. Known for having nightly live music (except Monday night football during football season) and drinks like the Balboa Buzz and the Sandy Feet, Village Inn is a lively restaurant where you can enjoy a bar menu or a more formal dinner, courtesy of Chef Victor Sandoval. We’ve tried several good dishes here, including their terrific burger ($13.25), pulled pork sandwich ($13.95), short ribs ($25.95), and fish and chips ($12.25). Another reason Village Inn is so popular with locals—they’re open until midnight every night. 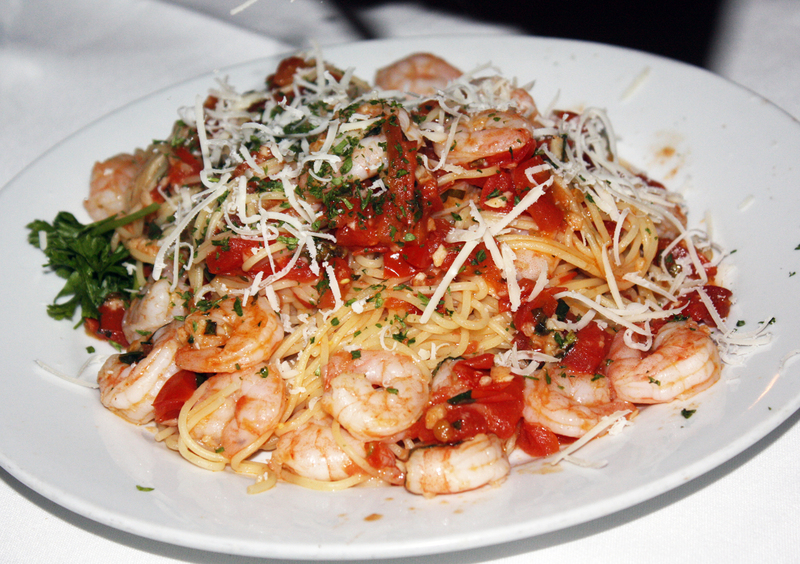 Catherine loves her Italian food, so of course she loves dining at Borolo by the Sea and Ciao restaurants, both on Marine Avenue. Two more restaurants worth noting: Basilic (Swiss French Cuisine) and Trattoria Mediterranean Cuisine. And if you have a sweet tooth, try either Sugar N Spice (which boasts having the original frozen banana since 1945) or Dad’s Donuts for a balboa bar. And there’s also Balboa Candy, an old fashioned candy store. 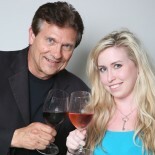 For more info and a complete list of dining options, visit DineNB.com. This entry was posted on December 23, 2014 by Off the Menu OC in Dining Out, Neighorhood Gem, Newport Beach, Restaurant Experience and tagged amelia's, balboa island, crocker's, dining, food, off the menu oc, wilmas patio.